The 2011 ALMS racing season is underway. 12 Hours of Sebring, one of the legendary endurance competition on the planet will witness the battle of two nemesis resumes. Peugeot and Audi traded fastest lap times in practice sessions. Both debuted new cars, who will have the higher ground this time after months of development and preparation? It is a mouth watering prospect that will become the hottest talk in the paddock. It will shape the headlines in the news and the winner will have a huge morale boost going into the season. For the loser, playing catch up is always demoralizing. So one could expect both teams are going all guns blazing for this race. Anthony Davidson, Sebring 12 Hours 2011. There is a lot of expectation from Peugeot’s side having failed to secure victory at Le Mans last year despite having the fastest machine. They went there looking very positive but the Audis easily pull a fantastic result at the end of the day. The manner of the defeat was perhaps the most excruciatingly painful to digest. Now the game is on. The first practice session was Audi R15+ TDI to take home. Romain Dumas set the benchmark at 1:49.253. Both Audis were first and second. In the second practice it was Audi again, Tom Kristensen at the wheel with a time of 1:50.424. However it is not all over as Peugeot responded by setting the fastest lap time in the night practice session. Anthony Davidson with a 1:48.901. Flying Lizards will seek to defend its GT drivers’ championship status this season. Nissan is finally back as an engine supplier. It will race under the Signatech Nissan name. 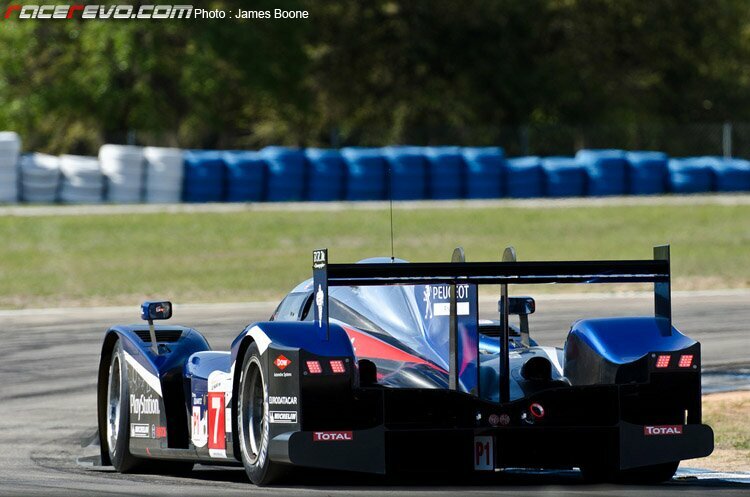 It will run a new ORECA 03 Chassis with a NISMO developed, Zytek Manufactured VK45 V8 powerplant.